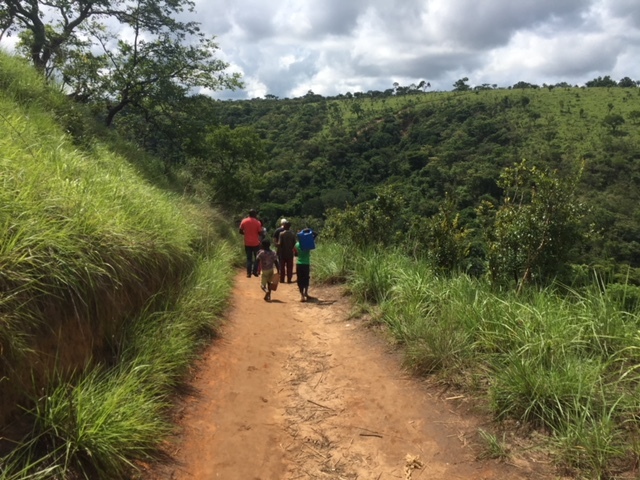 The walk to the spring at Kandale is a daily routine for many women and children. The village sits on top of a plateau and the spring is located down in the valley, about a 30 to 45 minute walk. My brother, Stan and I walked down to the spring during our visit to the village in October 2017. 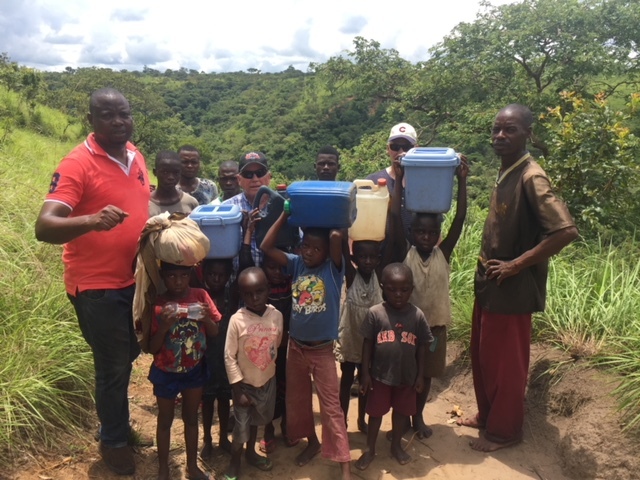 We hoped we could install a Ram pump to provide fresh spring water at a location within the village. Follow along with us through words and photos as we share the journey we took. The path wound its way down into the valley—a drop in elevation of 270 feet from the village to the spring. 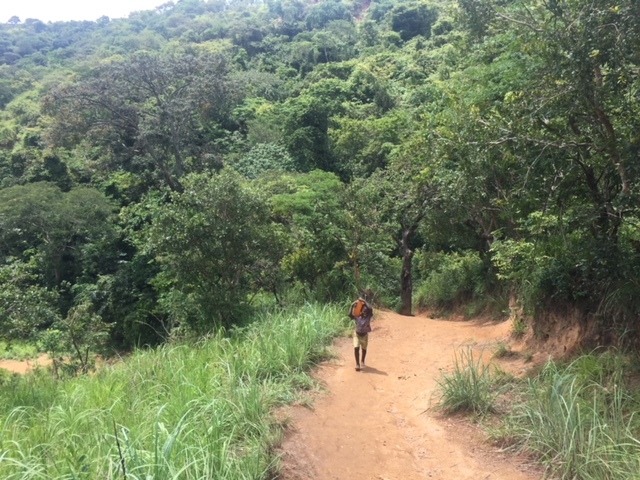 Portions of the path were easily managed and the slope was not too difficult to walk. But other times the path was narrow, steep, and washed out. Still, the beauty of the view took our breath away. During our walk we met a steady stream of people coming and going. The photos show some of them, including children who were all seven years old or younger. 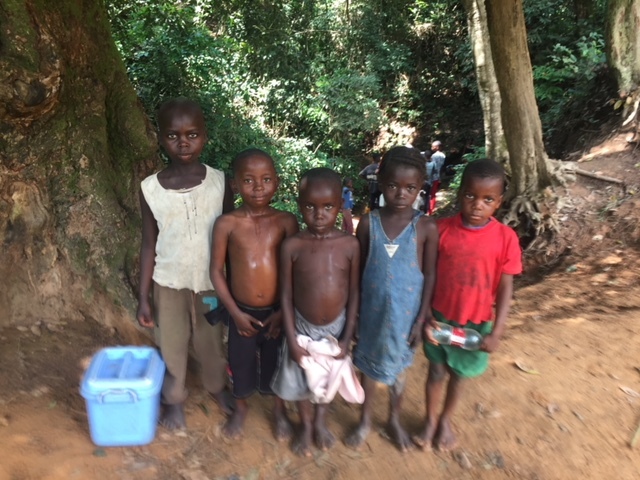 It is not unusual to see young children helping to get water—it is the norm in the DRC. 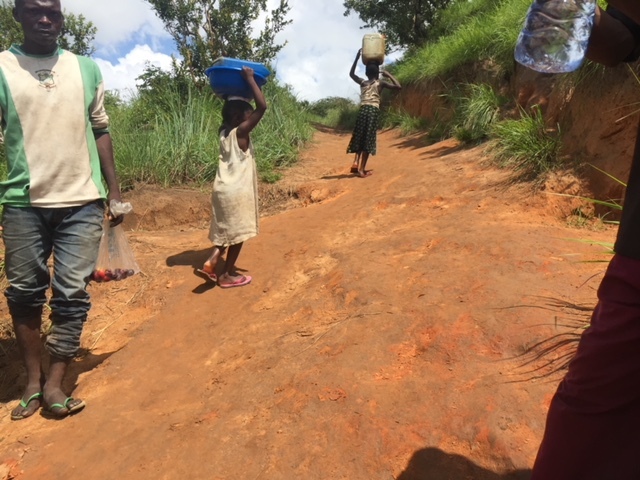 Women and children are tasked with getting water each day. An entire day can be spent obtaining water for the family. Many children never get an opportunity to go to school because of the daily need for water. We followed the children through an opening between the trees. 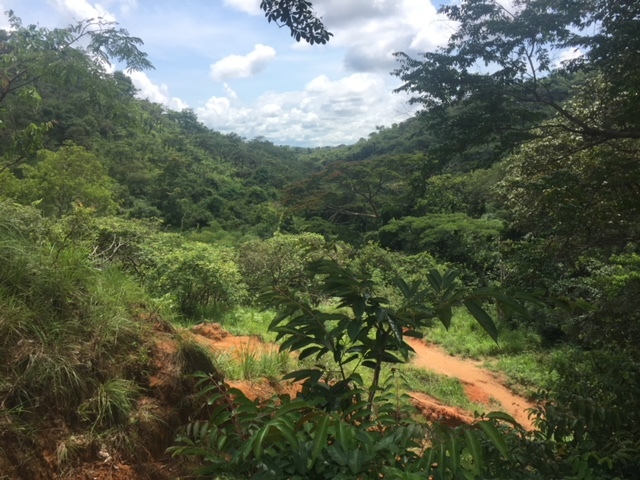 As we reached the final descent to the spring we heard the sounds of activity, voices, and water running downstream from the spring. The shade provided cool relief from the extreme heat. Stan and I found two very strong spring water sources feeding into one stream. Our hopes were high that a Ram pump might be a good option. 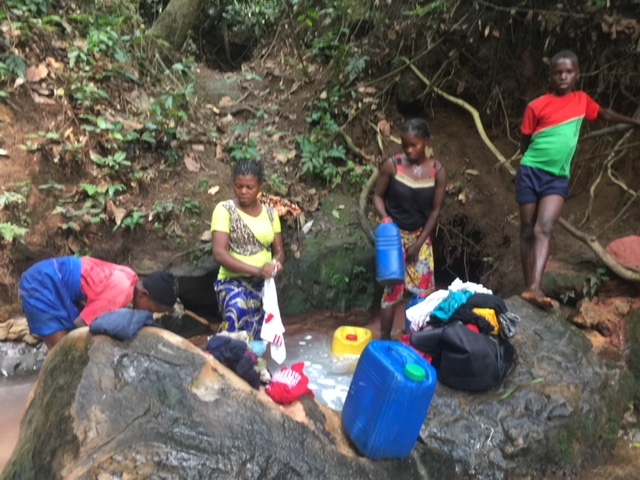 People washed clothes, took baths or filled their water jugs. The containers came in all sizes and shapes—bright yellow or blue plastic—referred to as jerry cans. The jerry cans weighed 40 pounds or more when fully filled. These bright colored plastic containers reminded us of the water crisis, which exists around the world for millions of people in third world countries. People spend hours each day with some sort of container strapped securely on their backs, held tightly to their hips or balanced on their heads. The average distance to a water source for people in the third world is 6 kilometers or 3.7 miles. 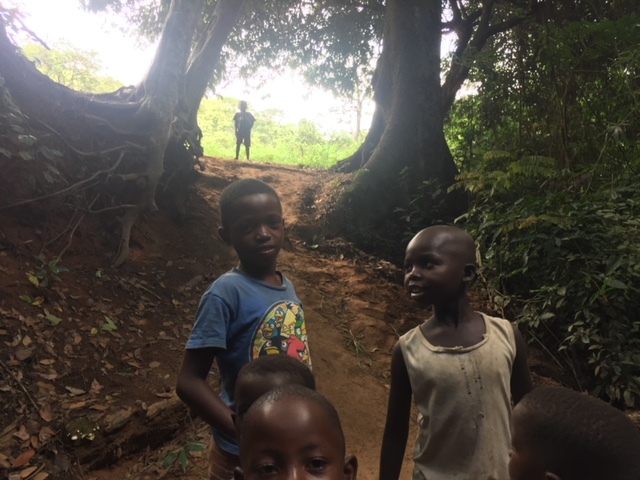 We followed the people back to the village. Most of them carried the water on their heads. Their trek uphill was even more arduous as the women and children lugged the heavy containers. The return trip took longer and required more precious energy—energy that required more food to sustain them. 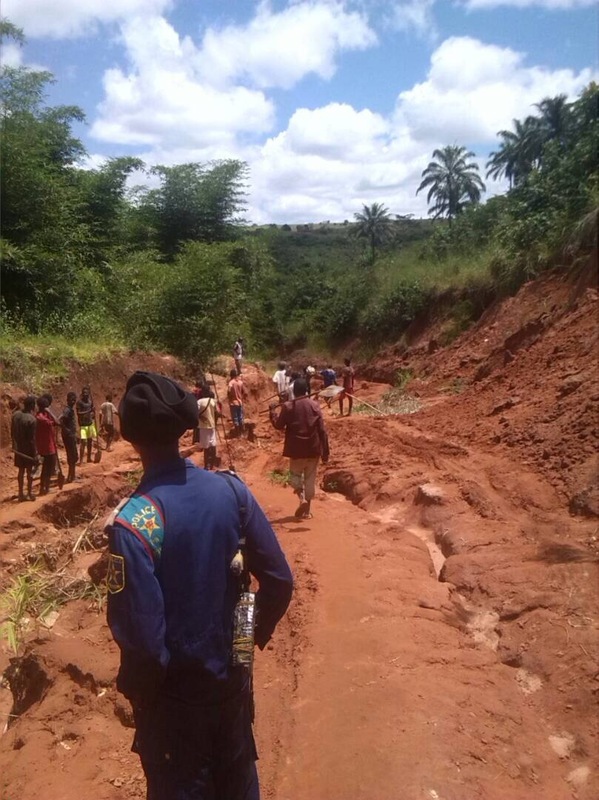 As we’ve mentioned previously, people in the DRC already live constantly on the edge of hunger. 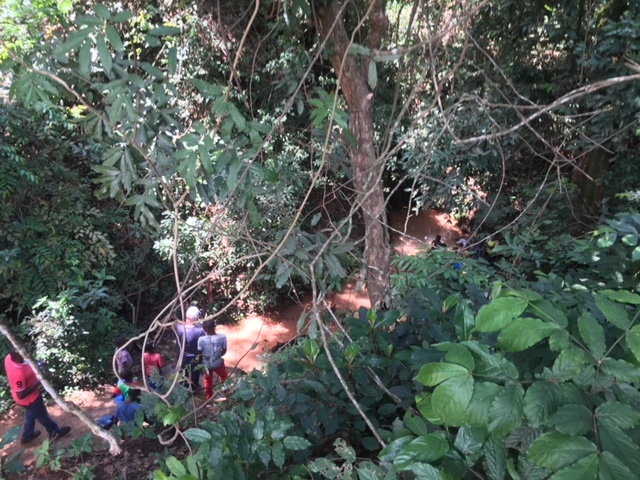 After our visit in October, Stan and I received news of a mudslide. It totally destroyed the spring. The village was devastated. Since then Kandale villagers have found a new water source, but it is even farther away than the spring. 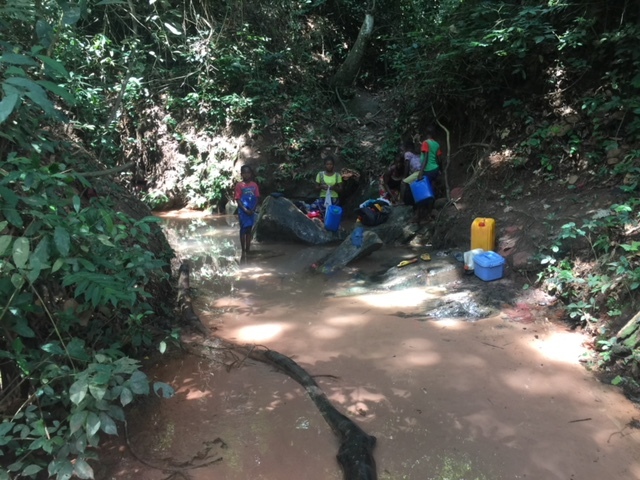 A Ram pump is no longer a viable option to bring water into the village. A Village Drill is the best course of action for Kandale now. 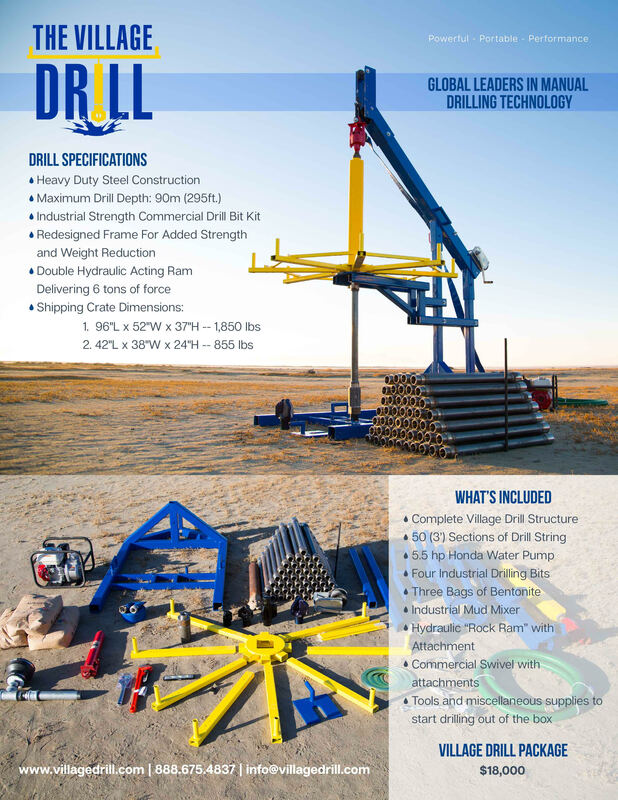 The Village Drill is a manual-drilling rig that will allow us to dig down to a depth of 220 feet. We have the money to purchase the drill and ship it to Congo. But we need an additional $20,000 before we can begin drilling for water at Kandale. The additional money will cover the costs of training workers, purchasing supplies, and transportation within the DRC. 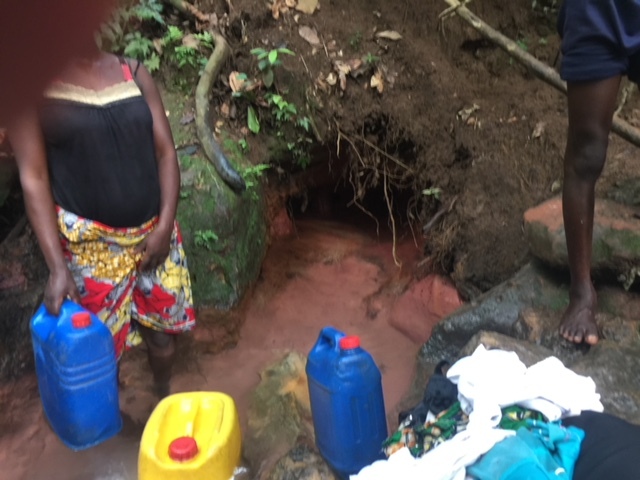 It is our prayer and Hope4Congo that we can bring relief to the people with a well that is located in close proximity to the village. This would provide them with clean safe drinking water. This would allow the women to spend their days in more productive ways. This would allow the children time to attend school. Your donations to Hope4Congo will allow us to bring change to Kandale and other villages through the use of the Village Drill. Please consider how you might bring Hope4Congo. Hope4Congo and tell us where you wish your donation to be used. Reminder: Everyone here at Hope4Congo is a volunteer. No one receives a salary or any pay for his or her work. Your gift will be used specifically where you ask it to be used.